The Government of India have declared support for metro-rail in cities with population greater than 2 million, to be constructed as joint-venture between central and state governments. Accordingly, metro-projects are on the anvil in many cities. In recent months, the government has also been courting Chinese and Japanese investments in metro and high-speed rail networks. Metro-rail, elevated or under-ground, is the most expensive mass transit mode. They impose massive upfront expenditures and consequent debt-financing burden, as well as high operating costs. It is therefore vital that the sustainability of each project is rigorously examined before its sanction. A failure to do so would leave local and state governments saddled with white elephants bleeding massive operating subsidies. It will also crowd-out resources from smaller transportation projects that deliver greater bang for the buck. A few considerations are therefore in order. For a start, we need to eschew the notion of metro projects as an aspirational symbol. Our cities need good urban transit systems, not necessarily good metros. Based on traffic and distances, urban transit modes span a wide spectrum from regular bus services to bus rapid transit, and light rail to metro rail. Each city should identify the appropriate mass transit mode based on its demographics, economic activities, commute patterns, land-use density, and metropolitan configuration. Second, evidence from across the world, developed and developing, shows that metro-rail projects, even the most efficient and with adequate traffic, are heavily subsidized. Not only do they consume massive public grants for construction, generally raised through taxes or government grants, but also their operation and maintenance (O&M) require large subsidies. In fact, the ticket collection receipts as a percentage of O&M costs, or fare-box recovery ratio, is generally much less than half the operating expenses. Even the highly acclaimed Hong Kong metro received just 28% of its income from fare-box receipts in the 2001-05 period. Third, apart from demographic considerations, metro rail systems generally need a peak traffic of atleast 40000 passengers per direction per hour (phpdt) to make any commercial sense. Just a handful of our cities would meet this requirement, even two decades from now. In countries like India, with fiscally strapped state and local governments and a very tariff sensitive demand-side, the risks associated with operating and maintaining good quality metro systems are considerable. State governments will find it difficult to subsidize metro rail systems for too long. Given the difficult political economy surrounding tariff increases, large volumes are the only insurance to atleast slightly mitigate commercial risks. This assumes even greater significance since global and Indian experience show that reliable estimation of traffic is a problem with transport projects. This is no less true of our metro projects. In the anxiety to push through projects, governments and promoters make optimistic traffic forecasts – high economic growth rates, planned toll increases, unrealistic diverted traffic from other modes, and large induced traffic. Further, when the economy is on the upswing and financing is readily available, the disciplining forces of credit markets take a back seat. Post-mortems of such projects from across the world, done during their inevitable renegotiations, invariably reveal considerable optimism and froth in traffic and revenue assumptions. Once traffic volumes fall short, governments are forced to subsidize and operators skimp on maintenance. The latter will pose considerable quality deterioration and safety risks, thereby engendering a downward spiral of lower demand, larger O&M deficits, and even more skimping. Furthermore, as these trends play out, the physical infrastructure of elevated metros, already a blight on urban form, will fall into disuse, dragging down property values in the neighborhood. It could be a very short distance from urban regeneration to urban degeneration. Fourth, there is more to metro railway systems than mere mobility improvements. The most successful examples of metros are those which have used it as an instrument to guide urban growth by integrating mobility with land-use. Those cities have used metros to promote transit-oriented development (TOD) by encouraging high-density mixed-use developments surrounding metro stations. They have employed proactive planning in the form of higher floor space index (FSI) in the vicinity of stations to concentrate growth. Such policies have helped cities like Copenhagen, Stockholm, and Singapore effectively manage the spill-over growth from the main city radially outwards in a planned manner. Instead of one massive urban sprawl, these metropolitan areas are characterized by a central core connected to smaller population centers interspersed with rigidly enforced green belts. Copenhagen has used the metro to develop a “finger plan” of radial growth of master-planned smaller towns. Singapore’s “Constellation Plan” involved the planned development of eight master-planned towns in the form of a “string of pearls” around the main city. Unfortunately all our metros, including Delhi, have overlooked this objective. The new metro-rail projects for Mumbai, Hyderabad, and Bangalore present a rare opportunity to recover lost ground and profoundly shape the city’s growth trajectory through a TOD plan. Policies like higher FSI and mixed-use zoning around metro stations promote density and transit use. These policies, when supported with investments to improve infrastructure carrying capacity, will encourage consolidation of land and vertical redevelopment. Affordable housing mandates, with more zoning relaxations and transfer of development rights, should be incorporated into these redevelopments. Another requirement for TOD is for the metro corridors to emerge from the metropolitan development plan and the strict enforcement of the region’s master plan. Since all such policies take time to yield results and require painstaking co-ordination among multiple agencies, they are rarely pursued with intent. Finally, the burden of financing such projects can be cushioned by capturing a share of the increase in property prices generated by the metro through policies like betterment fees, tax increments, and registration cess. Innovative use of zoning regulations – land use conversions and height relaxations – can also be used to capture a share of the increase in property value due to the new infrastructure. Metro rail projects that incorporate all these considerations, instead of being mere construction projects, can be powerful catalysts for urban transformation and smart growth. 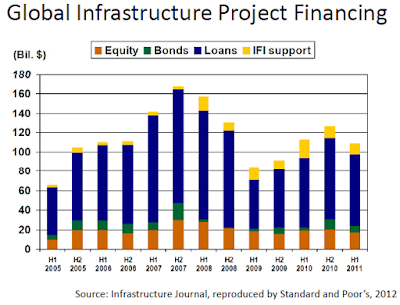 Where does infrastructure financing money come from? I blogged earlier about how, contrary to conventional wisdom, the overwhelmingly dominant share of infrastructure financing comes from bank loans and the bonds have a marginal role. 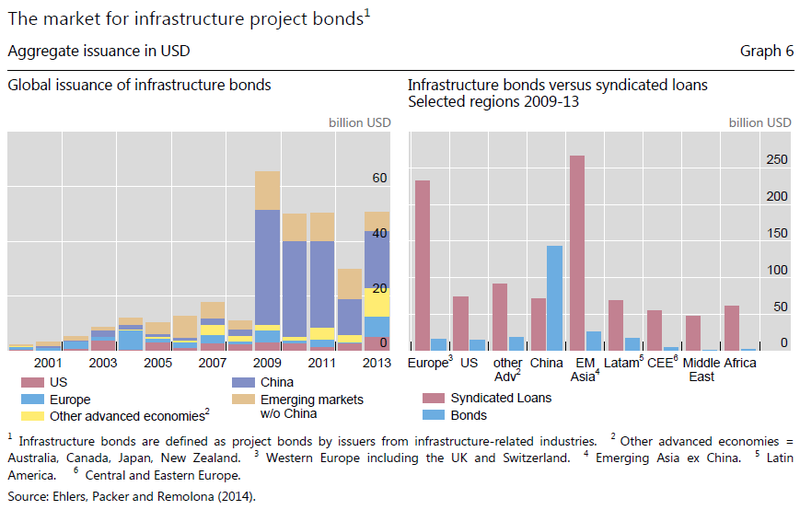 But for China, syndicated loans form the lion's share of infrastructure financing. 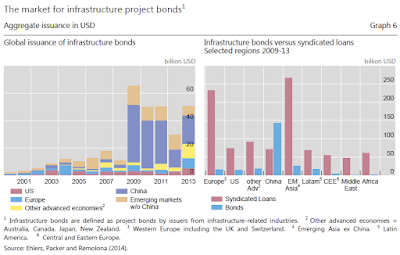 The total annual infrastructure bonds raised have been around $10-12 bn for all emerging markets excluding China. 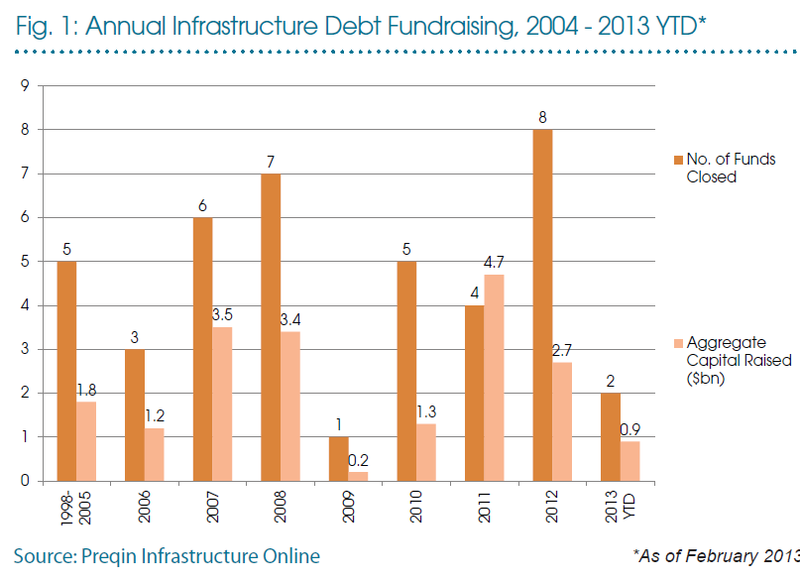 And about infrastructure debt funds, the amounts raised globally are minuscule compared to the requirement. 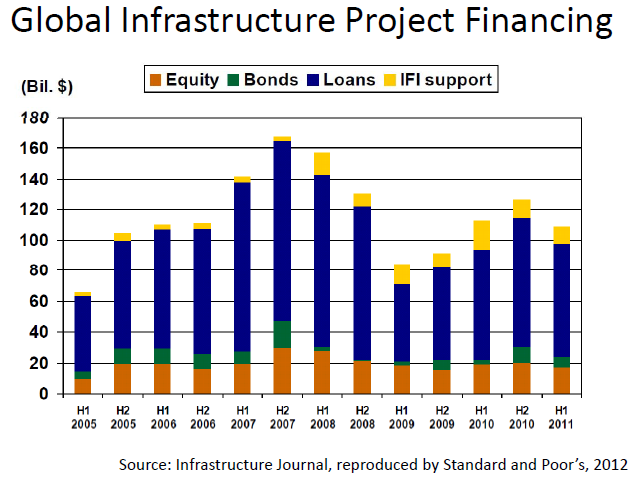 Just $4.7 bn was raised in 2011, the highest ever raised globally in a year by infrastructure debt funds. Infrastructure equity funds, which leverage capital from pension funds, while larger, tooform a small share of the total infrastructure financing and are concentrated in developed markets, especially the US and Europe. Globally, they formed just above $36 bn in 2013. Furthermore, structured equity or debt financing - infrastructure equity fund, infrastructure debt funds, or bonds - is rarer still in the construction phase, where bank loans are the most risk-appropriate form of financing. So as India explores various infrastructure financing alternatives, it would do well to keep in mind the reality that bank loans would necessarily have to form the lion's share of infrastructure financing. Alternative sources like structured debt and equity can only contribute marginally. This again underscores the importance of restoring bank balance sheets and their recapitalization. In any case, whether financed through loans or structured capital, rigorous project preparatory work is critical to the success of any long-term project. These projects will be able to attract private investments only if adequate preparatory work is done and rigorous enough feasibility and commercial viability studies and detailed project reports are available. Its preparation generally takes at the least 18-24 months. It may therefore be appropriate if, atleast to the extent of flagship infrastructure projects, a shelf of works are identified and their due-diligence and documentation initiated immediately, through public finance, and kept investment-ready. Insurance is a tool people use to transfer financial risks to an insurance company. Someone who purchases insurance to reduce his financial risks should logically then go one more step to further reduce the chance of an unlikely event causing him financial troubles. Thus, it is worth diversifying one’s insurance portfolio where practical. Placing insurance policies with different insurers ensure that a person’s entire financial portfolio is not in jeopardy should one insurer collapses. While there are regulatory measures in place to protect policy owners in such an event, they are still under tweaking and remain untested. It is still prudent that one takes necessary caution not to put all of his insurance policies with a single insurer. It is notable that different insurers usually excel in different policy types, i.e. Company A may have a very competitive hospitalisation policy whereas Company B provides the best term rates. Thus, it is fortunate that a financial portfolio designed to contain best-of-class financial products from different insurers already serves to diversify one’s insurance portfolio. Even within a single class of coverage, it may be worthwhile splitting up a large policy into smaller ones. For example, Ritesh may require a sizeable Rs.20000000 of death coverage to provide for his wife and children should he pass away prematurely, or perhaps Rs.2000000 in critical illness coverage in the event he suffers a major illness. Instead of purchasing a single policy which covers this relatively big amount, he can opt to split it into multiple policies with different insurers to diversify his risks. This gives him a few practical advantages. While insurers in india share the same definitions of critical illnesses, they only cover 30 to 32 out of the 37 defined critical illnesses. What this means is that an insurance policy may not cover certain critical illnesses. Thus, for a greater peace of mind and more comprehensive coverage against critical illnesses, Ritesh should split his insurance coverage between at least two companies. Furthermore, while insurers pay out upon the definition of the critical illness being diagnosed in the insured, there can be situations whereby the insured may not fully satisfy the criteria. Whether or not a payout will happen depends on the insurer’s discretion and goodwill. By placing all his coverage with one company, Ritesh places his fate in a single insurer’s hands and runs the risk of getting no payout. Diversifying his policies reduces the chance that he gets nothing at all – some insurers do pay a claim ex gratia despite not having a legal obligation to do so. Hypothetically, the insurer which does not pay Ritesh might feel compelled to do so if Ritesh manages to receive a payout from a competing insurer for the sake of reputation. Such is the importance of not letting a single insurer gain too much power over yourself. In fact, applying for insurance cover with multiple insurers benefits Ritesh right from the start. If he is not in the best of health, he is able to apply for insurance with different insurers and see which companies offer the best terms, thereafter placing his business with insurers that give him the most favourable terms. The downside is that diversifying comes with a little added cost as insurers usually give a slight discount for larger single policies. One has to weigh this added bit of cost into consideration when doing so. It also means a little more work which is nothing compared to the grief one might suffer if he places all his insurance with one company and it does not work out well. Besides, sorting out this work is part of what you are paying your financial adviser for. An important function of purchasing insurance is not just for transferring one’s risk, but also for a peace of mind. There is no peace of mind to be said if all of one’s insurance is with a single insurer, no matter how large or supposedly stable that company is. In light of few events in past, it is clear that even big corporations are not infallible. Do the wise thing and play it safe. Mark Mobius of Franklin Templeton expressed his views at the Morningstar Investment Conference held this week in London. He also spoke to Emma Wall, editor at morningstar.co.uk. Below is an excerpt from his presentation and interaction. Since 1988, there have been three bear markets. We're definitely in a bull market now. China is one example; it's really going up a lot. India has been doing very well. Of course, in every bull market there will be periods of decline, there will be corrections which can be as much as 20%. But you could still be in a bull market over the longer-term. The headlines are usually very bad about Africa. But if you go on the ground, if you look carefully at what is happening, you will find out in fact there is a lot of opportunity, tremendous opportunity. Take Nigeria for example, you read about Boko Haram and all these problems. But there are viable, great companies in Nigeria in which we've invested and they make money and they are doing very well. Eight out of the top 10 fastest growing economies last year where African, thanks to supportive fundamentals – young populations, commodity rich and technology savvy. So much of Africa’s resources are untapped – both commodity resources and human resources. I think that Africa will soon emerge as the manufacturing hub of the globe. Volatility has increased not only in emerging markets but in developed markets. In all markets now you are seeing much more volatility. Look at the price of oil, the way it's been jumping up and down. It doesn't mean that the demand for oil has changed that much, but the price has been very volatile. Volatility may create investment opportunities – but it spooks investors, causing them to crystalise losses. Market volatility is worse now than it has been in the past, thanks to quantitative easing – the huge volume of cash that has flooded global markets from money printing in the U.S., U.K., Japan and now the Eurozone. In the last 11 years there have been three instances of market underperformance but right now we’re on the up. What threatens investors’ returns is volatility. We like volatility as fund managers because it creates buying opportunities but our clients don’t. Unfortunately the volatility index shows that market fluctuations are happening more often due to central bank policy. Investors will have to accept that there will be these bumps in the road. Derivatives pose the greatest threat to markets. There are $691 trillion in derivatives globally – but the global economic output is only $77 trillion. This seems an extremely high number. Of the new companies floated on stock markets globally every year, 33% of them make their IPO in emerging economies. Of these, around 30% of them are suitable for investment. In emerging markets, the problem is not so much corporate governance, but liquidity, because many of the new issues are small. So if they are running at maybe 0.5 million a day in turnover, it is very difficult for big funds to buy. So, I would say of all the IPOs maybe, 20-30% could be purchased by normal large emerging market funds. The massive numbers of stalled infrastructure projects constrain India's economic growth on multiple fronts. Apart from preventing downstream economic activity (even sunk investments), it acts as a huge drag on the balance sheets of infrastructure firms and lending institutions. The Economic Survey has an analysis of such projects. Here is a graphical illustration of the magnitude of the problem. 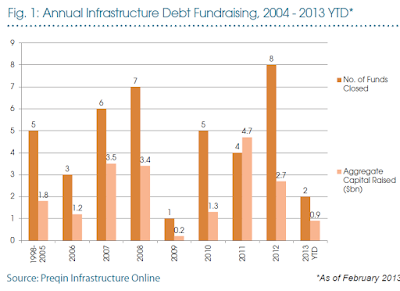 The decline in new investments coincided with sharply rising volumes of stalled projects since 2009. A high-level Project Monitoring Group (PMG), established mid-2013, was entrusted the responsibility of de-clogging 437 major stalled projects (342 with investments above Rs 1000 Cr) worth Rs 21 lakh Cr (or Rs 21 trillion). The sector-wise projects break up reveals that power, steel, and petroleum and natural gas make up Rs 17 trillion of these projects. 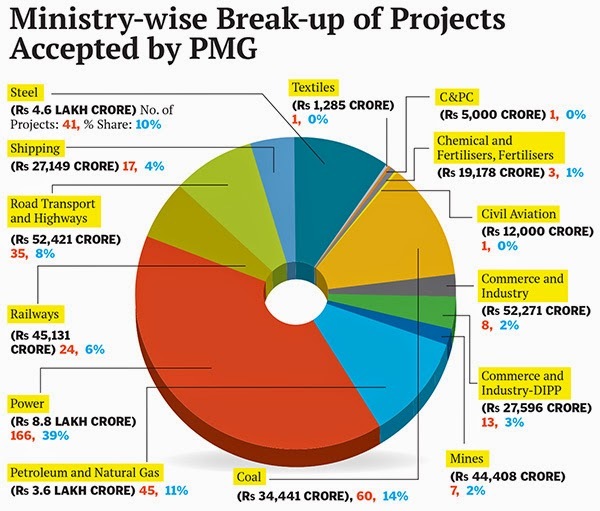 The Department-wise break-up indicates that Environment and Coal Ministries made up 60% of the projects. In late-2014, the Planning Commission presented to the Prime Minister that an additional Rs 5.7 trillion would be required to complete 738 central government funded infrastructure projects on which already Rs 5.6 trillion has been expended. 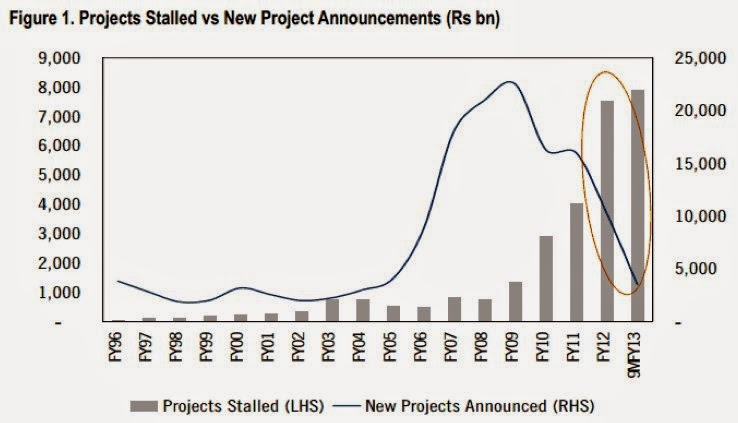 It also said that 83% of these projects were delayed, resulting in cost over-run of Rs 1.89 trillion. Interestingly, 274 out of the 289 railway projects were delayed, mainly due to financial constraints. The delays with railway projects are surprising since many of them involves gauge conversion or additional lines, which have limited land acquisition requirements. Financing problems and equally importantly, implementation inefficiencies and contractor delays, are likely reasons for the delays. In March 2015, the Ministry of Statistics and Program Implementation placed details of these 738 projects being monitored before the Parliament. 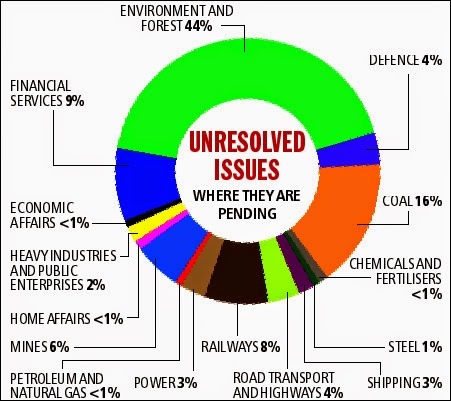 It stated that 315 of these projects had passed their implementation deadline. 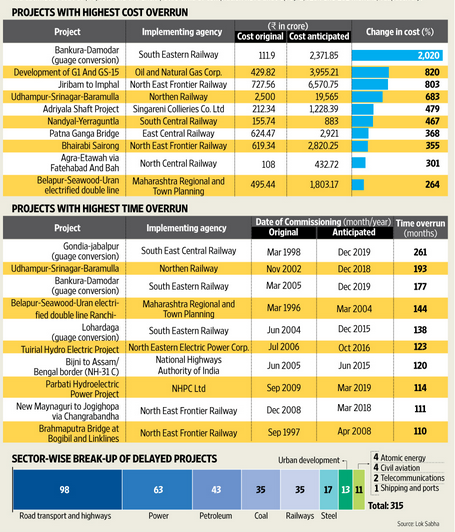 Road Transport and power formed nearly half these projects and railway projects formed eight of the ten most delayed projects. As to the major reasons for the delays, an HSBC study of the top 100 largest stalled projects in the CMIE records found that site acquisition make up a third. In contrast, another analysis of stalled projects, based on data for 804 such projects provided by the Ministry of Finance, appears to contradict the claim that land acquisition problems are holding back projects. The MoF data informs that just 8% of the projects are stalled due to land acquisition problems and 39% are due to unfavorable market conditions. 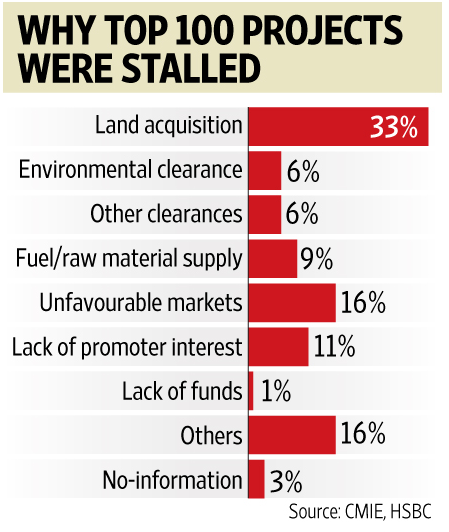 Interestingly, the reasons for delays in about a third of the stalled projects is unclear. There are significant variations across sources about the reasons for delays. It is clearly not as simple as the conventional wisdom that land procurement and environmental clearances have derailed many of these projects. My own belief is that a large numbers of these projects were initiated without rigorous due diligence and at a time when credit was easily available. Therefore, commercially unviability may be the under-stated real contributor to delays in the majority of cases. Even assuming expedited clearances and site procurement, itself no mean task, given the delays that have already happened, those projects too would undergo cost-escalation. In the circumstances, there are only two solutions - restructuring or scrapping. The former assumes that the project can be salvaged by changing its terms. Such changes in terms can potentially come in three forms. In purely private projects - steel, telecoms, petroleum, manufacturing, real estate etc - the developers should find the present market conditions commercially viable enough even with the increased investments required. In infrastructure projects - power, roads, railways, mass transit etc - the governments should finance the cost-escalation either by agreeing to pass-through some of the costs (through higher tariffs or tolls) or provide budgetary support for the increased expenditure. Finally, in certain cases, especially roads where traffic forecasts were optimistic, it may be possible to restructure the project merely by increasing the project tenure and without any additional financial burden. This assessment in turn critically depends on the sunk investments made in those projects. In projects where significant investments have already been made, restructuring becomes more likely, whereas those where investments made are marginal, developers may prefer to wait out or scrap the project. It may be necessary to carry out detailed analysis along these lines before we embark on any restructuring of projects. If the developers of purely private projects find them commercially unviable given the prevailing market conditions and government is in no position to bear the fiscal burden, then the possibility of restructuring diminishes dramatically. In that case, all talk of restructuring stalled projects is barking up the wrong tree. In that case, scrapping becomes the only alternative. Should you worry about the market's current volatility? The stock market has been volatile. Should one follow the dictum: Sell in May and go away? Indices tumbled during the week but picked up on Friday. In the midst of such volatility, investors tend to question whether or not it is the right time to get into the market or out of it. But frankly, they are asking the wrong question. Such questions are based on the presumption that they can enter the market and exit at the right time. Let’s get this straight, this is much easier said than done. Look back at your own track record. You may be boasting about the fact that you did not invest in 2007 when the market was on a roll. But did you enter the market a couple of years before that when it was at a low? Did you buy stocks immediately after the dot com crash? In 2008, when stocks were available at dirt cheap valuations, did you buy? That’s the double-edged sword of market timing – it’s not just about skipping the market highs; should you miss a crash, you miss riding the recovery that follows. Not too long ago, in October 2014, volatility hit the Indian market begging an answer to the same questions raised today. The reason at that time was more global - a likely recession is Europe, compounded by slow economic growth in the U.S., fear over the spread of Ebola, and geopolitical hazards. VIX (Chicago Board Options Exchange’s index of volatility) hit its highest level since late 2011 and the India VIX Index also jumped. But we got through that phase. The point is that if you ignore market upheavals and stay the course, you end up making money. If you want to be successful in the stock market, stick to your guns and don’t deviate from your investment plan. A successful investor is not one who accurately predicts the direction of the markets. To do so you would have to either be an astrologer with a very high success rate or God; chances are that you are neither. Stick to basics, which means you need to ignore the distractions and the desire to give way to your emotions and behave rationally. I had started off by saying that investors are asking the wrong questions. What are the right ones? The right questions should pertain to your portfolio. Are there any funds whose volatility is giving you heartburn? Then you could consider eventually dropping them from your portfolio. Have you reached your goals? For instance, if you were saving in an equity fund towards the downpayment of a house and you need to make the purchase soon, it would make sense to move that money out of equity now. Or, is it that you have a better alternative investment in mind? Do you want to invest in some property that is available for a song? Then you could consider offloading your stocks to finance this investment. Base your decisions on your goals and capability for risk. Not on the volatility of the market. On a lighter note, the entire saying is "Sell in May and go away, don't come back till St Ledger Day" and its origins are not Wall Street, but London. Summer sporting events were considered major events and the St. Leger Stakes was the oldest of England’s five horse racing classics and the last to be run in the year. The rick folk who traded were distracted with the social events and volumes would plummet in the summer months, leaving share prices flat, falling or at least volatile. The reasons for volatility now are very different, though an abbreviated version of the phrase is still thrown around.